In the fall of 2001, I knit the second sweater of my knitting career: the Roll Raglan from Yankee Knitter Designs. 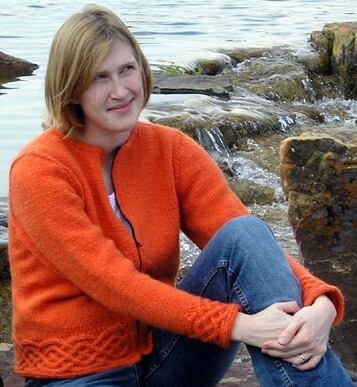 As my first sweater was such a disaster, I chose this pattern with a much more informed sense of what kind of sweater I would actually wear. It’s nearly identical to the J. Crew pullover that was really popular for a while, and which retailed for $35—about $25 less, incidentally, than the price tag for the yarn required to knit one. 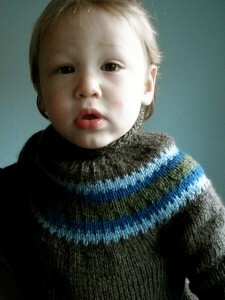 I’d been knitting for about five months at that point. I was already disinclined to view knitting as simply a means to an end, so that $25 difference meant nothing when held up against the pleasures of the needles. 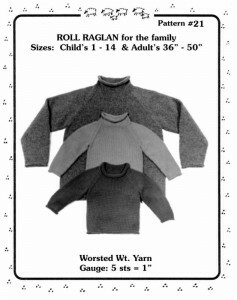 This pattern has you knit your sweater in four pieces (two sleeves, front and back) which are then seamed together before picking up stitches around the neck edge for the collar.1 Not a bad way to knit an early sweater, as it teaches basic garment construction, plus mattress stitch, which is an invaluable skill. You can also use mattress stitch for the shoulder seams. Much easier than set-in sleeves, which, over ten years later, continue to drive me crazy. 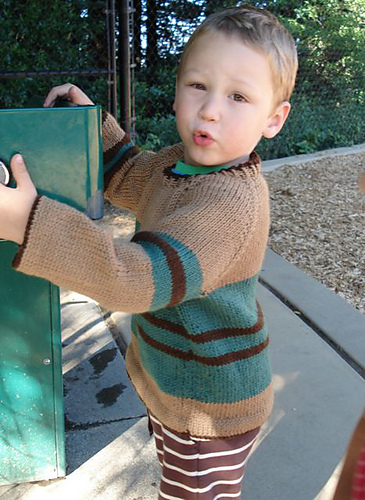 I still have this sweater. The only thing that stops me from wearing it all the time is that I finally admitted to myself that I run too warm for pullovers. That and, well . . . I sort of over-blocked the sleeves. Leave it to a zealous beginner to ruin a beautiful finished product. 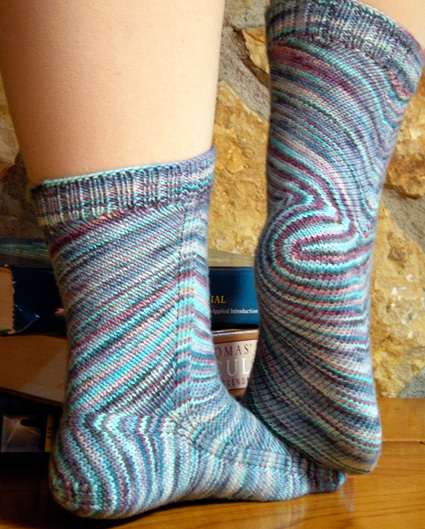 Between 2001 and 2006 I must have knit at least four more of these, following the pattern each time. On my second one, I experimented with adding some cables down the front. 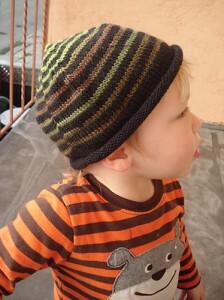 It was a failed experiment, mostly due to a poor yarn choice (Lamb’s Pride Worsted . . . hairy hairy mohair!) and the sweater ended its life as a felted Christmas stocking. The third one is tucked away in our Earthquake Emergency Kit, where it will hopefully go entirely unused. The fourth one was a gift to a good friend. 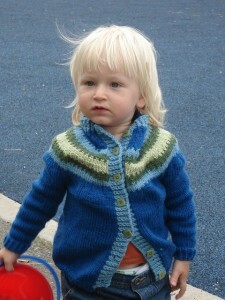 My early knitting designs were based on what I’d learned from this sweater. Halfdome, as it appears on Knitty, is worked flat and then mattress-stitched. At the time, it simply didn’t occur to me to design it in the round. Or to knit anything in the round, if it wasn’t written that way. Then Ms. M and Mr. S arrived. Bottle feedings, diaper changes, holding and rocking—all of a sudden, I needed to knit something that I could pick up and put down without worrying about where I was in the pattern. And with my brain incapable of mustering any kind of attention, the project needed to be mindless and simple. All of a sudden, knitting the roll neck sweater in the round made perfect sense. 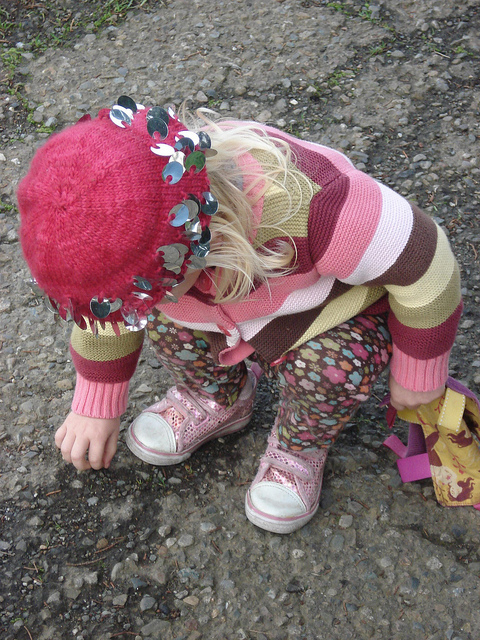 I worked from the bottom up, knitting the sleeves separately and joining it all at the yoke. It was perfect, except for one little problem: I misjudged the length. It came out about an inch and a half too short. When I squat down, it comes up a little too much in the back. This brought on the final development, something other knitters have known for a long time, but I just finally figured out: it’s much easier to size your sweater when you work from the top town. It’s simple really. As you’re knitting, just keep trying it on until it’s the length you like. Amazingly, this works for the sleeves and the total length of the sweater. And when the knitting is over, the only finishing to be done is weaving in yarn ends. Who’d have thought? It took Jane Richmond’s Classic Raglan Pullover to teach me this lesson. Applying it to the Yankee Knitter Designs Roll Raglan was a cinch. In my typical fashion, I have stolen all of these lessons for my own designs. 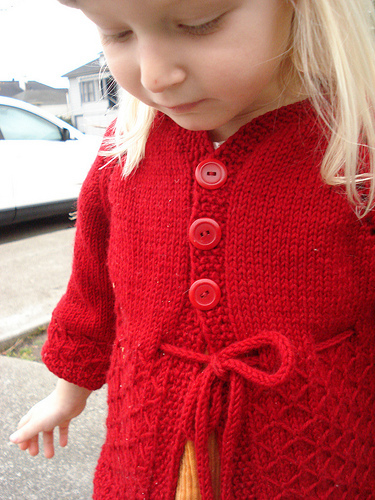 Stay tuned, because if all goes well, I’ve got a new zippered cardigan coming to the Knit Picks catalog. 1 This last fact taught me to distinguish hand-knit roll neck sweaters from the J. 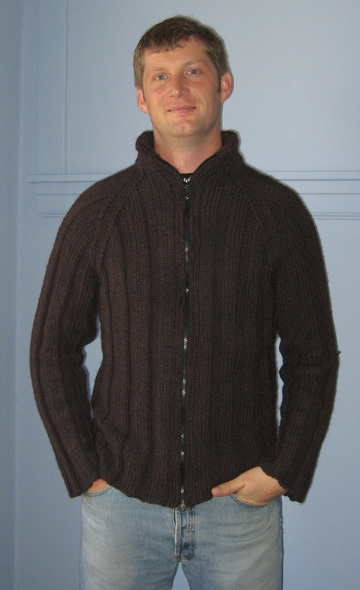 Crew variety, whose raglan seams go all the way up the collar. I just took a look at the archives and saw that it’s been over a year since I’ve posted. Sheesh! And to think it used to be like Grand Central Station around here. There is still plenty of traffic, though. According to my stats page, I’m still getting 150 -200 hits per day. An obnoxious percentage of those hits are probably from non-human visitors, but still! 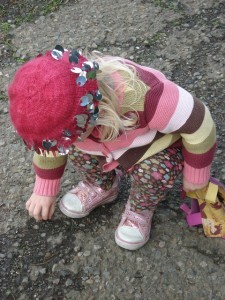 Not too shabby for such a quiet blog! So what have I been up to all this time? Lots! Hard to believe, but Ms. M and Mr. S are three years old now. The insomniac nights are behind us (or maybe I should say the child-induced insomniac nights are behind us. I still lose a night of sleep here and there, but now it’s my own damn fault) which, as any parent or medical resident knows, makes life much, much better. I’ve read that sleep deprivation, aside from turning you into a jerk, limits your brain’s ability to create memories. I believe it, because I can’t remember anything that happened during the entire first year of M’s and S’s life. I must have been around for it, because no one sued me for alimony, but it’s just not in the memory banks. This is probably a good thing. Anyway, the twins are starting preschool in the fall. Isn’t that crazy? Yes, it is crazy. By the way, Z knit both of those sweaters, in case you’re wondering. Mr. S is wearing Zoom by Melissa J. Goodale, and Ms. M is wearing Teresa Cole‘s Springtime in Hollis. When it comes to whipping out the kids’ knits, Z has me way, way under the table. In my pre-parenthood life, I had a part-time job, which left me enough time to write every day, and I’d close the occasional financial gap with freelance work. This model doesn’t work so well for raising a family. A year and a half ago, another part-time job opened in my department, for which I was all but recruited. Now, along with coordinating the medical student program, I also manage UCSF’s Fellowship in Family Planning1. Full-time hours are not my favorite thing in the world, especially when coupled with a one-hour commute, but the bills are paid and the kids have health insurance. The last time I had a regular, non-contract full-time job was . . . was . . . oh, the summer of 2001. I’m not really built for it. Then again, I don’t think anyone is. It’s how we do things here in America, though, so here I am doing it. As jobs that are not writing go, I could do a lot worse than helping to train the next generation of women’s health care providers. Is it possible to have a love affair with fermentation? Because I’m having one (with Z’s full knowledge and support, of course). Making beer means I get to geek out over food science on a regular basis. It also means I get to drink lots of beer, share it with friends, and make my apartment smell like a brewery about once a month. I have no idea why fermentation makes me so happy. Whether it’s bread, sauerkraut, or beer, the knowledge that there’s a colony of single-celled organisms doing delicious things right in my very own house gives me a deep, mysterious, contented feeling. It’s right up there with the satisfaction of finishing a sweater. 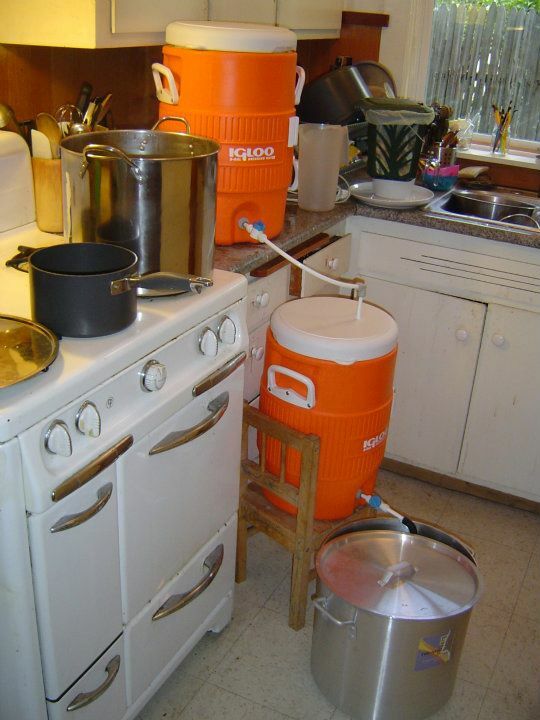 No wonder people have been making beer for 7000 years. Living on the west coast as I do, I’ve been brewing mostly IPAs with American hops. 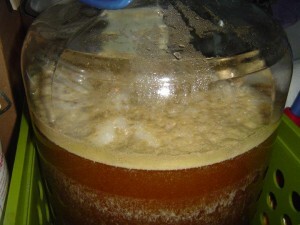 American ale yeast are really happy in my apartment, where the temperature is a near constant 68 degrees Fahrenheit. Except when the oven has been on for more than 15 minutes, at which point the temperature in the kitchen goes up to 71. I know this because I now have a thermometer in the kitchen. Not outside the kitchen window, in the kitchen. See? Total geekery. Now that I have kids, when people ask me if I’m still writing, it’s in the same tone of voice as if they asked if I’ve recently attended a funeral. Really, I don’t know how anyone manages to write with kids around. I do it once a week by paying the nanny for an extra hour, going straight to a café after work, and profusely thanking Z for making dinner and putting the twins to bed, both of which are usually my job. At this rate, my second novel will be done by 2050. For the fact that I’m working on a novel at all, I have National Novel Writing Month to thank. The entire first draft was written between November 1st and 30th, 2011. The knowledge that there were 256,6182 other people engaged in the same crazy project was the push I needed. Now I’m using what all writers with children use to write: my own exhausted will. It will get done, though, and hopefully this one will fare better than my last one did. 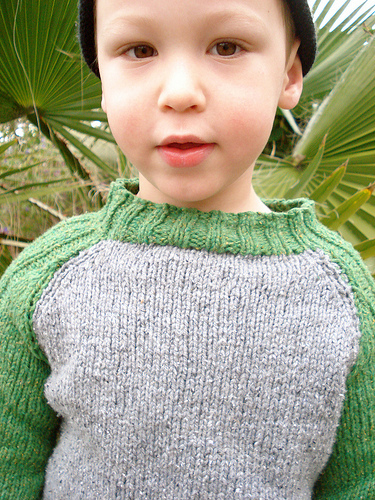 The Classic Raglan Pullover is an awesome pattern. 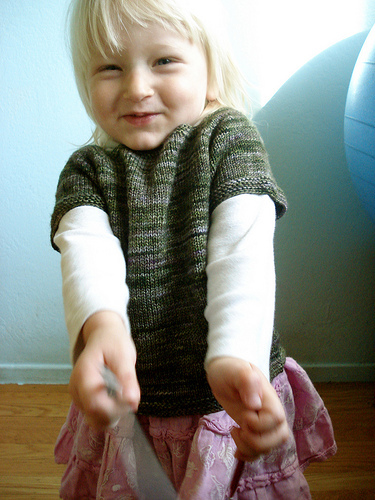 It’s one of those meta-patterns that you can use to launch just about any sweater idea, for kids or adults. It’s a top-down construction, and Jane Richmond‘s technique for working the collar is ingenious. So ingenious, in fact, that I stole it for my latest design, which will hopefully be hitting the Knit Picks catalog later this year. 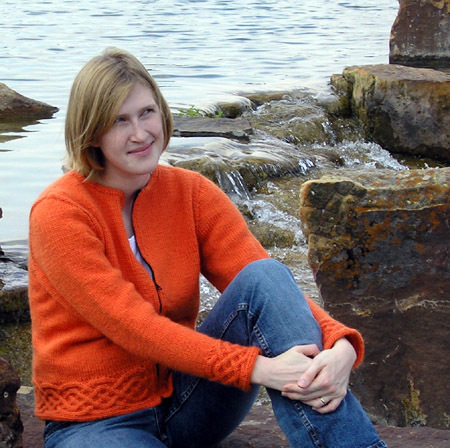 Oh, I’ve also been building websites, like Bren Ahearn’s — go check it out, fiber artists! 1 Do I have any readers who aren’t pro-choice? Don’t worry, I still love you. 2 This is the official number of NaNoWriMo participants from 2011. Numbers for 2012 are not yet available. When I was a kid, I imagined that one of the features of the afterlife was a Statistics Room. In this room, you could learn any figure or number from the recently departed life. How many times did you sneeze? How many pairs of shoes did you wear? How much total time did you spend kissing your partner? How many times did you say or write the word “the”? I now know that the notion of the Statistics Room stemmed from a childhood anxiety that even though these numbers existed, no one was keeping track of them. My personal anxieties are a little different these days, but there are still a few numbers that I’m really wondering about. For example: how many total yards of yarn in the world are devoted to hand-knit items for people under five years old? Before my kids were born, I expected my contribution to this number to be much greater than it actually is. Little Ms. M. and Mr. S., who are now just over two years old, spent the first year of their lives growing at an alarming rate. For all of the baby items I knit for my then-pregnant friends, I had no idea that baby-sized knits are rarely worn for more than, oh, about five minutes. 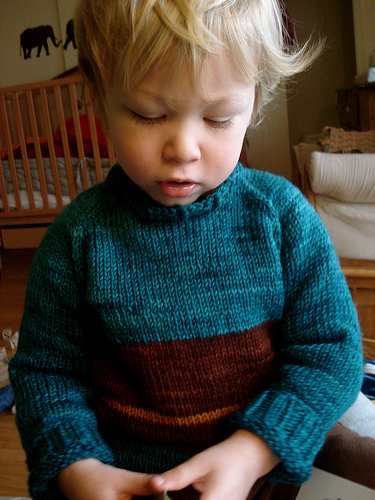 The Fibonacci Sweaters you see in Fig. 1 above were designed and knit for Knit Picks’s Independent Designer Program, which means I sent the sweaters off to Knit Picks not long after that picture was taken. When the sweaters came back—only a few weeks later—M. and S. couldn’t get them over their heads. 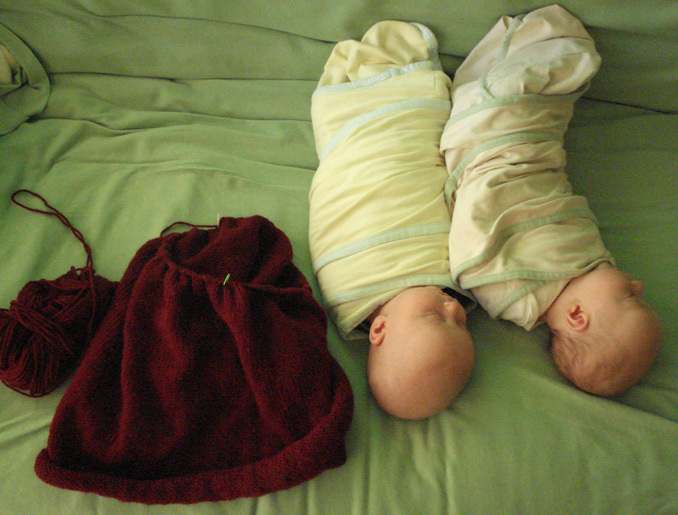 It’s much more fun to knit for the twins now that they’re older and not expanding at quite the same rate. 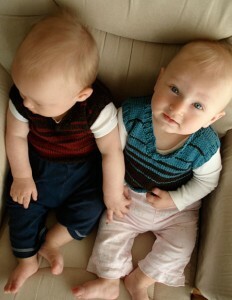 The items Z and I knit for them are worn for almost two months now! 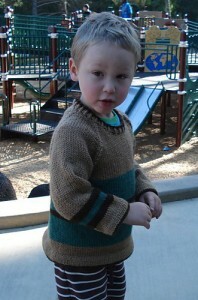 That said, Z is far outstripping me in the knits-for-kids department. See Fig. 2 below. The issue here is obvious, and mostly attributable to Z’s uncanny ability to knit and read at the same time, a superpower which I can’t even hope to attain (see Fig. 3 below). The only thing I can do while I’m knitting is . . . um, knit. I can’t even walk and talk at the same time without running into a parking meter. But I’m working on filling in my column in Figure 2, along with balancing out the recipient ratio. As you can see, M has been getting way more stuff than S. Luckily for us, they’re still too young to notice. For now.